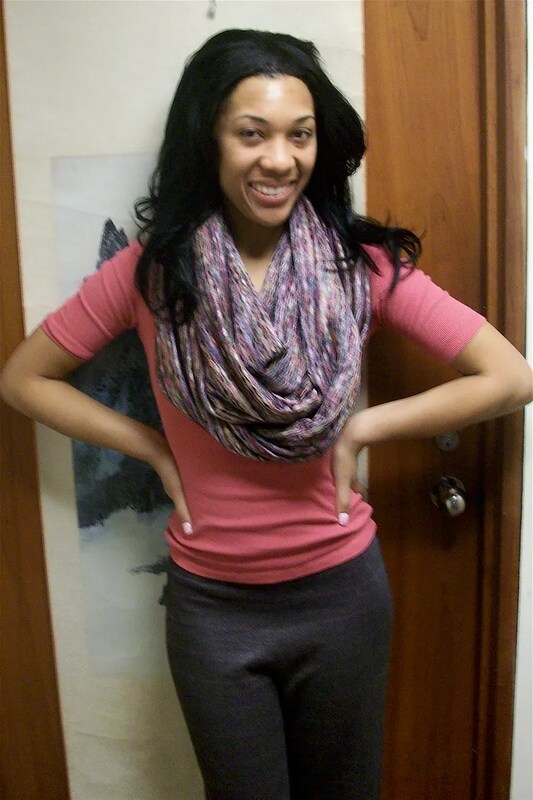 The Infinity Scarf is INgenius! About two years ago a younger, hipper, cooler friend of mine was wearing a piece of fabric on her neck from American Apparel. It was just a circle of knit fabric. I thought it was the dumbest thing I’d ever seen. Then, being the trend hog that I am, I got on board and am now the conductor on the circle / infinity scarf train. 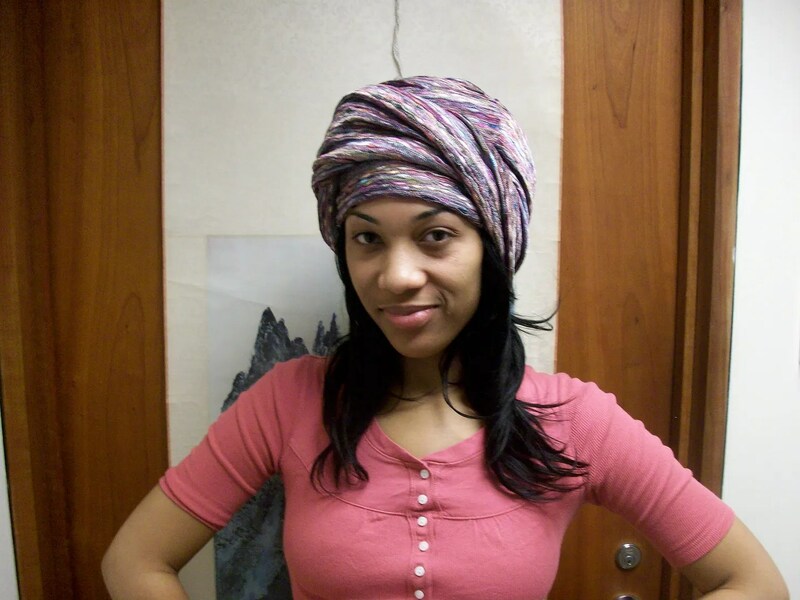 There are so many ways you can wear it (as modeled by my friend Chezia below). And best of all, it takes 30 minutes to make. 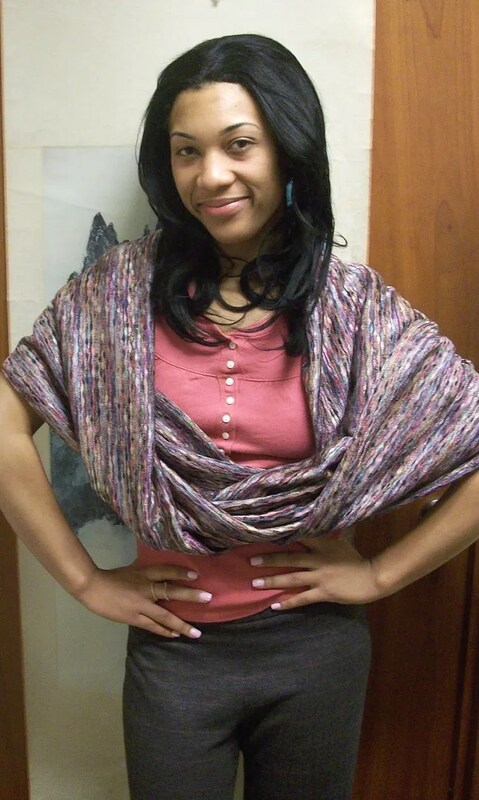 I used Joann’s knit from the stash that I bought on clearance this summer for like $3 a yard. Checked measurements on line of various scarves and sewed the whole thing up on my serger. There are more ways than what I did with the scarf below. One big loop. Should be about a foot shorter than this for most people — falling between knee and hip. This one is my Secret Santa gift for work. I made a cream one for myself. To be honest, the cream was going to the woman at work, but she’s short, pale with blond and occasionally red hair. It occurred to me that the cream I loved on me might blend in on her. 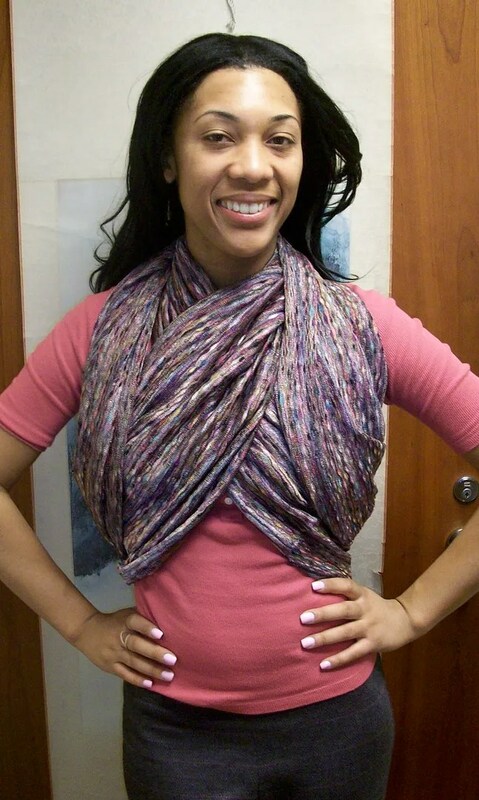 If you need a quick and easy gift, make an infinity scarf! I haven’t had time to write and photograph a full tutorial. But, generally, you want to make the fabric wide. You’ll want it to be at least 12 inches wide when folded (so cut at least 24 inches width). Even wider if you’re interested in things like the dress or skirt options. 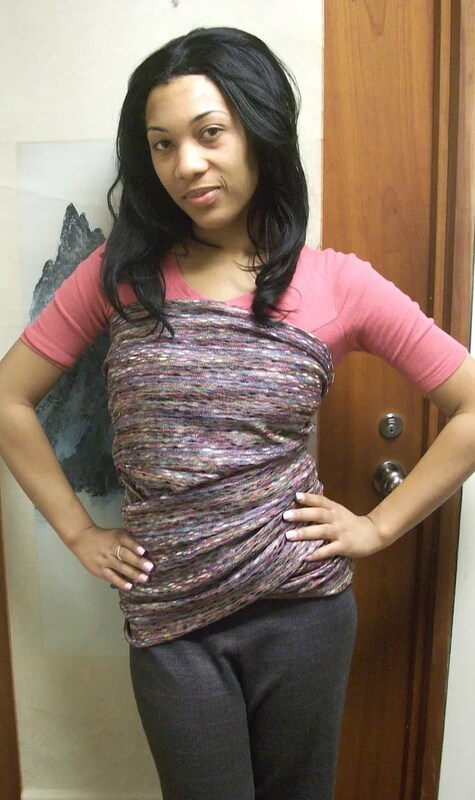 When sewn together, you want the loop to reach between the knee and the hip. Again, this will depend on the person’s height. If there are still questions out there, I can try and detail with some photos over the weekend. Previous Post Sweatshirt Dress Done! Very interesting! Although I think the layered styles are more for the skinnier among us. Nice tip! I think this is a great idea. There are days when you are having a bad day particularly when it is a rainy one and need a convertible article of clothing that can go from a scarf to a head wrap in a snap. Thanks for the idea. Well my skinny daughters and nieces are definitely getting these for Christmas! Cute! That is beyond cute! I think I’ll make a couple for stocking stuffers. Thanks! Ahaaa! You’ve just given me an idea for my S-i-L’s Christmas gift! THANK YOU!!!! ;-D This is really cute, btw! That fabric choice is definitely better than the cream for a pale blonde. So cute! That’s very cool. I thought about knitting one… I even casted on. I don’t think it’s going to happen. Sewing one may be my best bet. I really love the knitted versions on Ravelry. Although, I’m with Erica B – scarfs are so long and this project would probably take me longer than knitting an entire sweater. Beautiful, though. I see others beat me to it…I was going to say that for a slightly longer-time-to-make version click on Ravelry and type infinity in the pattern search box. 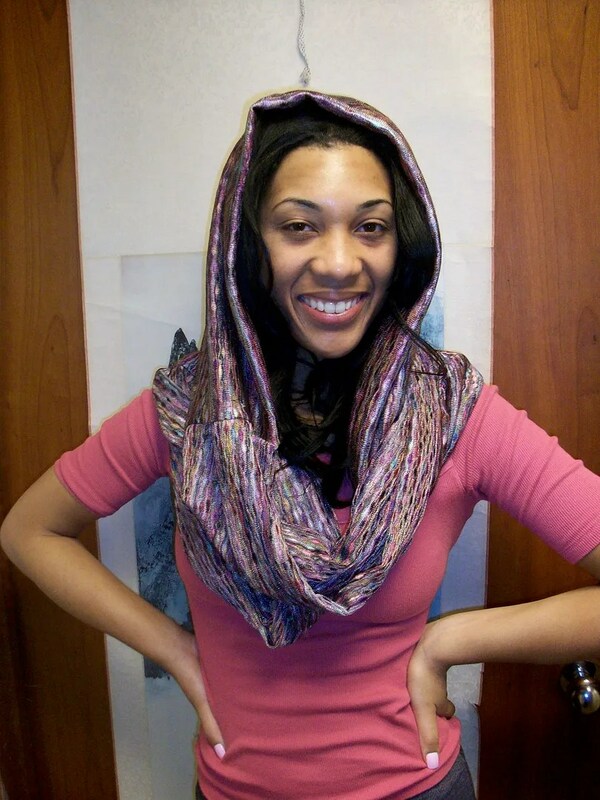 Tons of wraps and scarves come back. Most interesting are the braided challa types. This looks infinitely faster and easier, trust me! Love this! One question tho: did you sew it in a simple circle or with one twist like a moebius? Simple circle! If I were doing a very short version — like chest length, I would add a twist. I’ve knitted a smaller one of these and I really liked it, but this larger version is truly brilliant. As I have to make a secret santa gift for a short, fat, gray haired woman I think I will have to steal your inspiration. I love the fabric you’ve used. adding… I went to American Apparel today and checked these out. Honestly- it had been on my to do list for today for a week now! At AA it is simply a tube of fabric. No finished edges or any thing. Also, the cut edge on the one I looked at was crooked. REALLY CROOKED! So Renee, I went to the fabric store and purchased 76$ worth of knits for Infinity scarfs. I think everyone I know is getting one. Thanks a lot woman! Thanks so much Cidell! That was fast. I have a striped knit that may work for this. I need to go check one out to make sure I get it right. Thanks for the inspiration – I will be giving out a few of these out as well. Cute idea! My girls would love this! Love the scarf. And I am so happy you are back sewing. The sweatshirt dress is cute on you and your pants turned out so well also. That is a fantastic idea. I’m absolutely making one for my husband’s cousin who I know only well enough to know that she would like it. Smart and right on trend! Brilliant! I think I’ll try a few of these for myself! This is timely. I was just sitting here thinking about a gift for someone who has everything. I also have some fabric which will be perfect (I think) for her coloring. Thank you! Lovely! I looked at the the American Apparel demo and it seems as though that scarf has raw edges and its width is about 40 inches (because she doubles it over to make a skirt). That scarf appears to be just one layer of fabric with raw or selvedge edges. 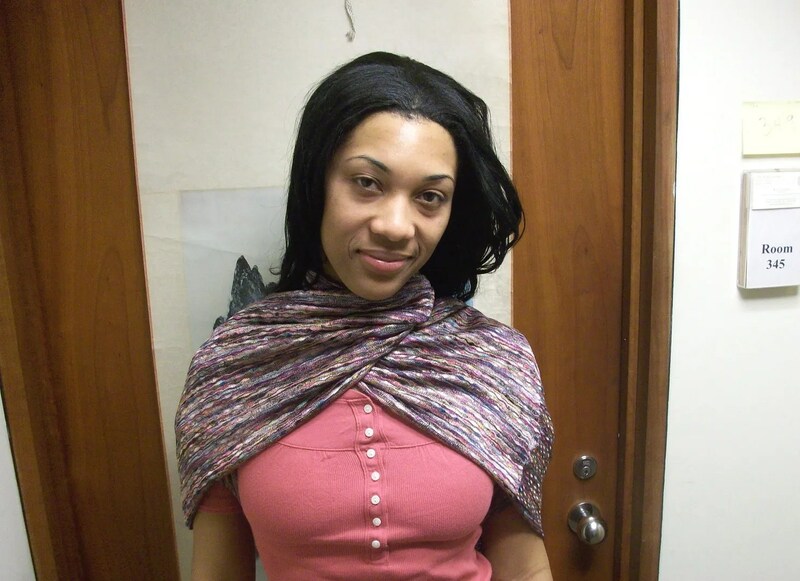 Does your scarf have raw edges or is it completely enclosed? Is it a long lengthwise fabric tube (long seam sewn on the grain) with edges that are then enclosed (shorter seam, sewn on the crossgrain)? Or is it one long piece on the grain that is then connected by sewing a seam on the crossgrain? Very interesting. Yes I am feeling kinda stoopid and would appreciate really detailed instructions when you have some time to do them. Very cool idea. these might be presents for people all year long! thanks for sharing this. Hello, you’r so nice with this scarf…., some call it magic scarf here!